Mark Levin is fed up with the Republican leadership in Congress. A day before Rep. Mark Meadows, R-N.C., filed a motion to remove House Speaker John Boehner from his leadership post, Levin called on Boehner and Senate Majority Leader Mitch McConnell to resign. At the Young America’s Foundation’s National Student Conference in Washington, D.C., the popular talk radio host and author spoke with The Daily Signal about the future of Republican Party. 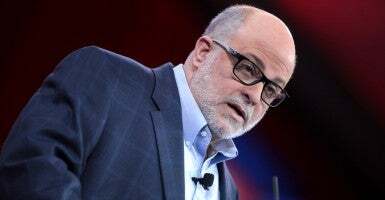 Levin’s new book, “Plunder and Deceit,” comes out Tuesday. Levin was quick to embrace Meadows’ move to oust Boehner, inviting him on his radio show Tuesday night and urging conservatives to stand with him. Levin called it a step in the right direction for the conservative movement. Levin said Republican leaders have fostered Obama’s agenda rather than delivering on their election promises to the American people. According to Levin, Boehner and McConnell have done more to “dispirit” Republicans than Obama. Since the GOP gained a Senate majority in the 2014 election, Levin said Republicans have not lived up to their responsibilities. Despite supporting the actions of Meadows and other conservatives, Levin confessed that their attempts are not likely to succeed. Nevertheless, he commended their efforts. Chelsea Scism is a reporting intern for The Daily Signal and member of the Young Leaders Program at The Heritage Foundation.